Darryl here, on behalf of Joanne, who asked me to provide an update to all of you. It has been a most challenging week. Things changed quite dramatically on Sunday night when Joanne ended up in the hospital due to a high fever. She spent a day in Emergency until she was finally able to be admitted into the Oncology ward. In the meantime, on Monday, additional results came back, from her latest CT scan, that indicated further progression, this time to her brain. This news has set the next chapter of this journey into motion. The focus of Joanne’s treatments has shifted from active to palliative. There are no plans for additional chemo at this time. Tomorrow, Joanne is having the first of several palliative radiation treatments focused on the brain and esophagus progression. The intention of this phase of radiation is to ease the onset of symptoms that would otherwise arise from this new progression. Next steps and future treatment options are unclear at this time. Joanne, Gord, Michelle, Craig and Brian are facing these latest challenges with the same strength and focus that we have all seen and drawn inspiration from in the past months and years. The continued support and prayers from all of you are appreciated very much, especially during this next most challenging phase. It must have been a challenge just to type this, as I know I'm seeing the screen swim through tears. As ever Joanne and all of you are in my thoughts. To begin with , thanks for keeping us updated with Joanne's progress. I'm sure it is challenging to both face the health struggles as they arrise and to find the words to tell us all about it. We are most grateful for this blog so we needn't burden you all with constant phone calls. I'm so sorry the news is not good right now, but knowing you all somehow you will focus on just today and get through this too. Rest assured that our hearts go out to you, you are never far from our thoughts and you are often lifted up in prayer. May God continue to give you the grace and strength you need. This is such sad news. A difficult joureny seems to continue to throw hurdles in your path. As always your picture with the flowers shows that amazing strength that you all have. You look beautiful. It gives yor friends and family strength as well to see you so happy. I will continue to send all of the energy I can your way. As always our prayers are with all of you. Thinking of everyone there . Hi Joanne, My heart is very heavy as I read this update from your brother. I keep thinking of our many escapades through Austraillia New Zealand and Figi and our connection over the last almost 30 years. That is certainly a long time for a friendship to grow!!! I hope that you can gain some strength from the love and prayers that I am sending to you. It's Joni from Chestermere. I read the news and I'm writing this through tears. You are as ever in my prayers. You have been such an inspiration to me in this damn fight with the beast. Sometimes without all the girls from BCorg, I don't think I could make it. You with your special gift of expression make things seem easier. Loving hugs to you. Your Alberta bc partner. Please let Joanne, Gord and the Kids know that we are sending our love and prayers out to them. Joanne, we are hoping for a miracle... you are continuously on our mind. Joanne, I hate hearing about this latest development but please know that I am hoping with all my heart that there are better days to come. Even though I've only been blessed by your compassion and wisdom for a short time, it is obvious to me that so may people love you and that you have made a difference in the lives of so many. I am here for you and will do anything I can to help....you need just ask. Peace to you, my friend. Please tell Joanne that I adore her and value her and want more of her (as I know you do). I can't be selfless. I'm sorry. I know I should be. I can't let her go. Please tell her that. Thank you so much for the beautiful words and gorgeous photo of beautiful Joanne. Tell her I'm thinking of her always and miss her "voice" online. Can't really express how much I miss seeing her the last year or so. All my love to her, Gord and the kids, to you and your family as you make your way through this. My heart is breaking as I read this, as I always knew it would. I cannot begin to express what Joanne has meant to me personally, as a friend and as a fellow survivor. There really are no words. Please let Joanne know that I am holding her and her whole family close in my heart as this journey unfolds. I like other read Darryl's posting thru teary eyes. Our hearts go out to you at this time in your journey. All of you are in our thoughts and prayers. May you continue your journey with the grace and strength that has gotten you this far. Take care of yourself and each other. I have only met you through the BC Discussion Boards. You wrote something that inpspired me to become a stronger person. It was about teaching our children through our lives and perhaps even with our journey into death. You continue to inspire me and know you are in my thought and prayers. Thank you for coming into my life. You are passing on a beautiful baton of courage and dignity. You don't know me and I don't know you. I learned about you through Australian Fe. My heart goes out to you and I do hope you can find the strength to fight this all the way! Positive thoughts I'll send you all the way from Holland. 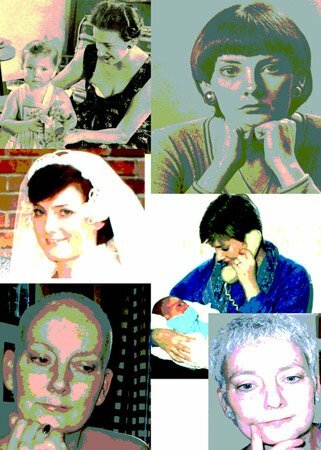 Joanne is most loved at breastcancer.org. Her remarkable spirit, her clearness of family-loving purpose amidst the haze of disease, her kind and gentle encouraging words to her sisters and brothers all led me to seek her posts. Your family has much to be proud of, as Joanne has weaved her fabric worldwide strand by strand. My heart is heavy, but my limbs are strong as I lend them in help to carry our dear Joanne forward and upward in peaceful spirit. May I walk quietly along with you in this journey with Joanne and may she feel the arms of her sisters around her in love. Thank you for posting this link on bco. I cannot express the depth of anger that I feel at this disease! Anger- and sadness. Joanne- you are a shining light for our online support group. My heart goes out to you and your family. You are always in my prayers. Thanks Darryl for letting us know what is happening. I only wish we could stop it. Love and prayers to you all. My heart breaks for Joanne and all her family and friends as I read this latest update. But thank you for the update, I can't imagine how difficult it was to write. Joanne is in my thoughts and prayers everyday as is her family. Sending peaceful thoughts and lots of love from Millie in NC, USA. All of your friends and family and have said it all so graciously and so well. We love you all and this is not fair and if we could change this for you I know we all would. You have so many people who care and we should all be so lucky to have our families touch so many and make such a difference. Take Care of eachother and let those around you love you and hold you up, you aren't alone we all love you. I follow the ups and downs of Joanne's fight, here and on the BCO site. My heart goes out to her, her family and loved ones at this latest milestone. Joanne is a woman for us all to admire, her poise, kindness, strength... would that we all could be as capable. I'm sending my heartfelt best wishes to Regina tonight.